Stop me if you’ve heard this one before. A small farming village is routinely looted by a gang of bandits, who steal most of their crops and pillage the town. The farmers are too weak and untrained to defend themselves, so they head into town to find warriors to fight for them, in exchange for food. They are successful, eventually recruiting a team of seven, who return to the village and help train the farmers for an upcoming attack. I’m still preparing for that upcoming Magnificent Seven Lambcast special (expect Battle Beyond The Stars to crop up in a weekly post soon), and fortunately Seven Samurai – which I’m ashamed to say I’d never seen before today – also appears on all five of the lists I’m working through, so this is a prime opportunity to cross it off. Now as I’ve mentioned previously I’m a fan of the 1960 version of The Magnificent Seven, so the plot here wasn’t exactly new to me, so brace yourself for a lot of comparisons in this review. I’ll get this out of the way early, I think I prefer the western remake. It’s not that there’s anything particularly wrong with this Kurosawa classic, at least not a lot that isn’t also a flaw in the John Sturges version, it’s just that almost everything this film conveys is gotten across in a film over an hour shorter, and that has to mean something. 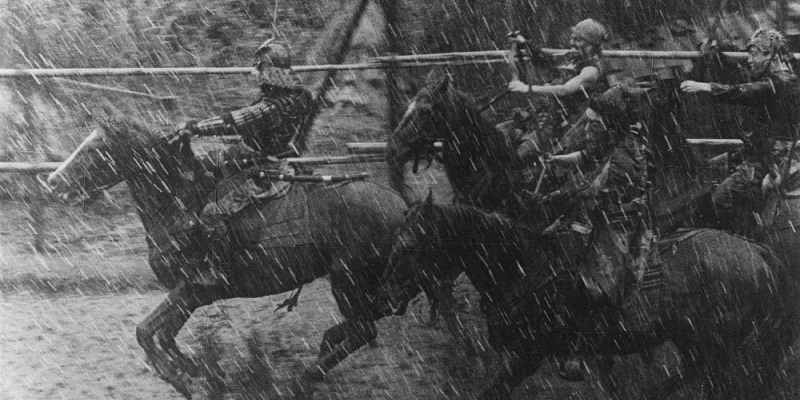 Granted, Seven Samurai has more of a cultural angle to it, with a great deal of the film dealing with aspects of ancient Japanese culture – predominantly shame, pride and what it means to be a samurai – that The Magnificent Seven doesn’t have to deal with, but the remake still adds other additional elements besides. Also, whilst I’ve remarked before that in The Magnificent Seven the allocation of time and personality isn’t exactly fair amongst the crew – James Coburn is under-used, Horst Buchholz is far too prominent – the same can be said even more so here, with three of the seven sharing essentially interchangeable roles, and Toshiro Mifune providing at least 85% of the entire film’s character. 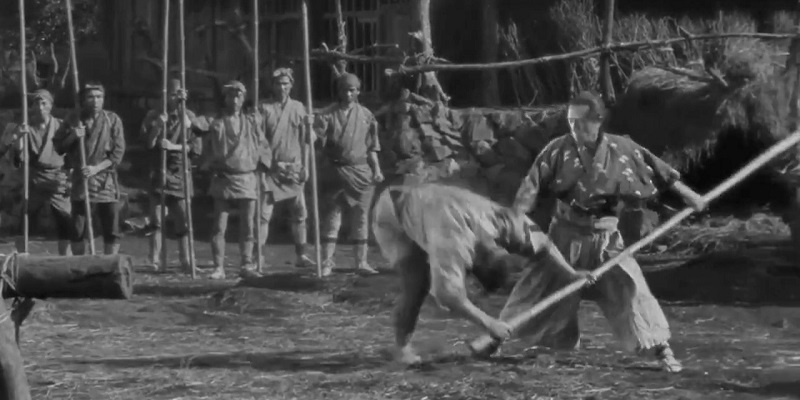 To e fair Mifune is an uncontrollable force of nature that has to be embraced rather than quashed, and he’s easily the most entertaining part of the film, but given the 207-minute run-time you’d think there’d be a little room in there for someone else to get something to do. 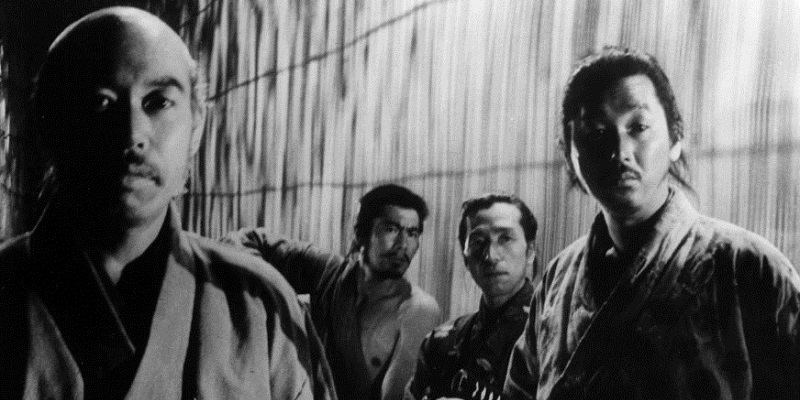 When it came to the remake, they even tried to be a bit more fair by splitting up Mifune’s role and dishing out elements of his role to Steve McQueen, Brad Dexter, Robert Vaughn and the aforementioned Buchholz. Anyway, enough comparisons, let’s get into this film on its own merits. Whilst I stand by that it is too long, the storytelling is actually fairly economic. We aren’t shown every second of the adventure, some parts are wisely cut as they’d be otherwise unnecessary for us to see. During the quest to find the samurai, for example, we see the villagers in town looking from man to man trying to find a suitable candidate, before one of them plucks up the courage to go and ask. We don’t see the conversation, instead it cuts to the villager being tossed into the dirt, with the man he was asking being offended he was even approached. As with Das Boot recently too, the scale of the film-making here is impressive but in the opposite direction. Where that was uncomfortably confined, here there is a very epic sense of size, particularly once the action moves to the farming village. I’m certain everything was shot on location in either an actual or fabricated village in the middle of nowhere, with several shots making extensive use of this huge amount of space and dozens of villagers, fighters and bandits running all over the place. The action is well realised if a little sparse, and the acting is on top form throughout as well, especially from the actors in more supporting roles, such as amongst the villagers. One in particular, an older man named Yohei (Bokuzen Hidari), was a particular stand-out for me because of his supremely expressive face, making him permanently look like the sad actor mask from the famous happy/sad logo. 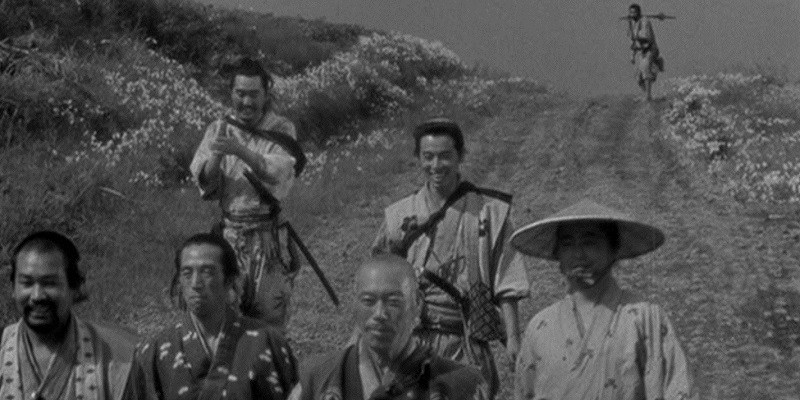 Amongst the leads, there’s no stopping Mifune from taking over everything. He gets the most to do, has the most personality and character to do it with, and relishes every moment. 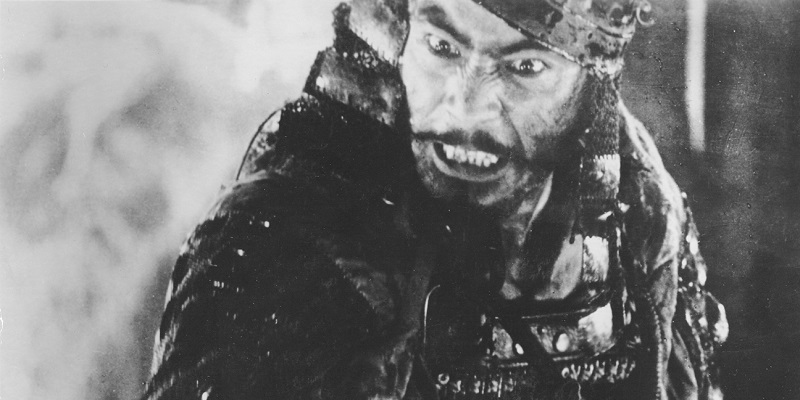 This was his seventh film under Kurosawa’s direction, so clearly the director made as much use of his on purpose, but I feel it under-valued the contribution of the rest of the samurai in the team, except for Takashi Shimura and Isao Kimura as the team’s leader and a young recruit (the Yul Brynner and Host Buchholz roles, if you will) as they get a bit more to do than the others as well. 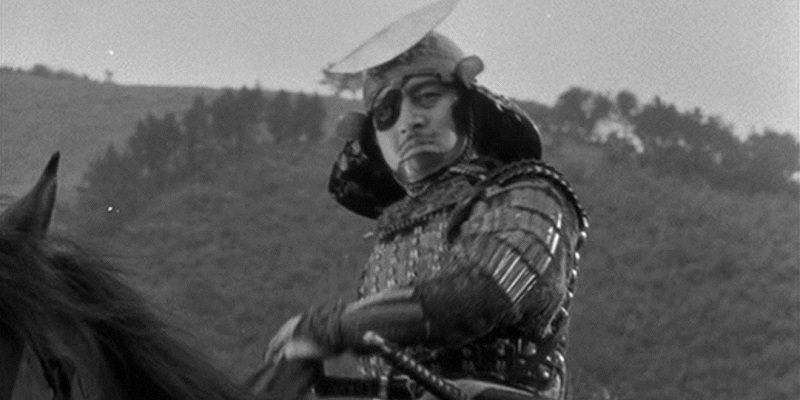 The film is named Seven Samurai, not Three Samurai And Four Other Guys Fighting As Well But Don’t Worry About Them Quite So Much Because Neither Did The Writers, so I feel the balance should have been a little fairer. Of the other four, I did enjoy Seiji Miyaguchi as Kyūzō, and not just because he’s in the James Coburn role of not saying much but being incredibly adept at fighting. The villain, alas, left a lot to be desired, as we spent very little time with him so he failed to make much of an impression beyond is large and impractical crescent-shaped headdress, but again he is up against Eli Wallach, so there’s not much contest there really. All this being said, this is still a phenomenal achievement in film-making that really should be seen by all film fans, it’s just unlikely that I’ll revisit this one again soon when The Magnificent Seven is just so much more watchable. This entry was posted in 08/10, 1001, 5-Star 500, Choose Film, Empire Top 301, Empire Top 500, Review, TF 100, The List and tagged Akira Kurosawa, Bokuzen Hidari, Daisuke Katō, Isao Kimura, Keiko Tsushima, Kokuten Kōdō, Minoru Chiaki, Seiji Miyaguchi, Seven Samurai, Shinpei Takagi, Takashi Shimura, Toshiro Mifune, Yoshio Inaba, Yoshio Tsuchiya by jaycluitt. Bookmark the permalink. For me it actually comes down to a very simple question: Who do I think is coolest: Samurai or cowboys? Samurai wins hands down. Jests aside I do prefer Kurosawa’s version because it is fo full of detail and, yes, fillmed with an economy that it does not feel like 207 minutes, but more like normal running time. I was not bored for a second. That does it then, I’ve always found cowboys to be cooler for some reason.